She studied Theatre at the Yale Drama School, appeared on the stage frequently and originated the role of Jessica in the original 1954 production of The Tender Trap on Broadway. 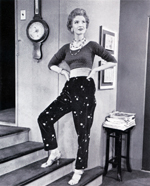 She won the 1962-63 Sarah Siddons Award for her performance in the Chicago production of Mary, Mary, in which she starred in the lead role as Mary. John Raitt and Julia Meade in a publicity photo from the 1960 stage production of The Pajama Game at the North Shore Music Theatre in Beverly, Massachusetts. John is Bonnie Raitt's father, and is well known for his decades of work including movies, television and theatre. Check out the very nice John Raitt web site for more info. Julia Meade in a publicity still from Mary, Mary, Blackstone Theatre, 1962. 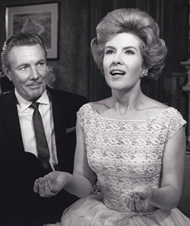 Julia and Scott McKay in a publicity still from Mary, Mary, 1962.